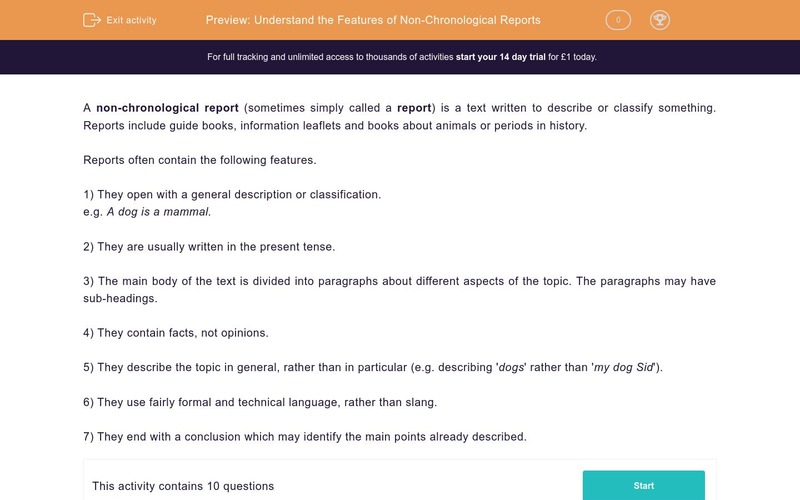 In this worksheet, students consider the language conventions and grammatical features of non-chronological reports. A non-chronological report (sometimes simply called a report) is a text written to describe or classify something. Reports include guide books, information leaflets and books about animals or periods in history. Read the following statement and decide whether it is true or false. A description of how a helicopter flies is an example of a non-chronological report. Reports usually begin with a general description or classification of the topic. Reports are always written in the present tense. Reports don't need a conclusion as all the information has already been presented. A leaflet encouraging people to visit Rome is an example of a non-chronological report. A non-chronological report may contain sub-headings. A report never contains photographs or diagrams. Which of the following features is not normally found in non-chronological reports? Which of the following features are usually present in non-chronological reports? A description of helicopters would be a non-chronological report, but because the text describes how a helicopter flies it is an explanatory text. Most reports are written in the present tense, but a report on dinosaurs would have to be written in the past tense as they no longer exist. Such a leaflet would be a persuasive text, but if the leaflet was simply describing Rome and its features, then it would be a non-chronological report. Reports often contain photographs or diagrams. They can be very helpful for the reader.